Metal Blade Records is proud to welcome Killswitch Engage to its roster! Partnering with Sony Music Entertainment outside of North America, the band will be releasing their upcoming album in 2019 worldwide. Currently finishing work on their upcoming album, Killswitch Engage have taken a break from recording to embark on a summer European tour with Iron Maiden. 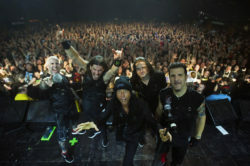 The trek will also see the band appear at various premier festivals (Sweden Rock, Graspop Metal Meeting, Hellfest, etc. ), along with a few special headlining shows. Then in the fall, the band will be touring across Australia with Parkway Drive. See below for all dates! Formed in 1999 out of western Massachusetts, Killswitch Engage is often credited as one of the most influential metal acts in the last 20 years. Spending much of their career on the road, the band has enjoyed premium slots on major USA tours, including Ozzfest, Warped Tour, Taste of Chaos, Rockstar Energy Mayhem Fest, Music As a Weapon, and Trespass America, as well as countless international festivals around the globe. Having shared the stage with acts ranging from Rise Against to Slayer, the diversity and versatility of their touring is unparalleled. Their songs have been featured on Guitar Hero III, Rock Band, John Madden, the Resident Evil III soundtrack, and as entrance music for WWE wrestling champ CM Punk. Twice Grammy-nominated, Killswitch Engage has sold over 3 million records worldwide, with The End of Heartache and As Daylight Dies both certified Gold in the U.S and Silver in the UK. The band’s latest album – 2016’s Incarnate – landed at #6 on the Billboard Top 200, #1 on the Current Rock Albums chart, and debuted at #1 overall in Canada, #5 in Australia, and #10 in both the UK and Germany – a testament to their international reach. 2018 will mark the end of the Incarnate album cycle, which saw the group reach new heights with its collection of anthems that set the heavy music world ablaze. 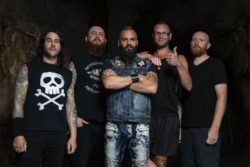 Co-founders of Killswitch Engage – guitarist/backing vocalist Adam Dutkiewicz, guitarist Joel Stroetzel, bassist Mike DAntonio, and lead vocalist Jesse Leach (who returned six years ago after a decade-long absence) – plus longtime drummer Justin Foley, are currently working on a new album, with Adam Dutkiewicz handling producer duties once again. Employing their usual unrelenting determination to continually release powerfully potent work, Killswitch Engage plans to deliver another trend-resistant, timeless record that feeds the soul, touches the heart, and strengthens the mind. Stay tuned for more news about this new album coming soon! Sheryl Crow Announces New Tour Dates Supporting Latest Album “Be Myself”. GWAR To Embark On The “Vans’ Warped Tour” Tomorrow; New Album Details Revealed! What do you do when you’ve co-headlined one of the hottest metal touring packages of 2017? Well, like any rock band that cares about its fans, you do it again, but you take it to the places that missed out the first time. And that’s exactly what metalcore masterminds Killswitch Engage and legendary thrash/metal masters Anthrax are announcing today — “KillThrax II,” a 29-city tour of North America presented by SiriusXM that kicks off January 25 in Montreal, Canada and will zig-zag across the continent to wind up in Portland, ME on March 4. Confirmed tour dates are below. Go here for all ticket and purchasing options. Havok will serve as the opening act for the entire tour. Confirmed dates for KillThrax II are below. (New York, N.Y.): Metalcore forefathers Killswitch Engage and thrash legends Anthrax announced in December that they will hit the road this Spring to co-headline a 27-date North American tour, presented by SiriusXM. The bands’ itinerary will also include an April 15 appearance at the Texas Independence Festival in Austin, as well as each band headlining two solo shows separate from the double bill. With KsE and Anthrax rotating the closing slot over the course of the dates, the tour will hit the ground on March 29 in Montclair, NJ and then criss-cross the continent, wrapping up in Boston on May 7. The intense and dynamic The Devil Wears Prada will provide direct support on all dates. Multi-tasking Hatebreed frontman Jamey Jasta will perform solo as Jasta and open the first 10 shows of the tour — including the two Killswitch Engage headline shows that do not feature Anthrax. Pittsburgh’s Code Orange, who are being hailed as one of the most exciting metal acts of 2017 with the release of their new album FOREVER, will open all of the dates thereafter. Code Orange jump on the tour on April 11. Tickets are on sale via the KsE site, the Anthrax site, and the TDWP site. Please visit those locations for all details regarding ticketing. Confirmed dates for the KsE and Anthrax tour are as follows.